Save 10% Off The List Price! 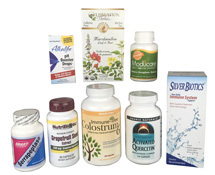 This pack combines all the products featured on our Interstitial Bladder Health page. These supplements can be effective in supporting interstitial bladder health. A unique bioflavanoid derived from plant sources, Activated Quercetin™ his an advanced dietary supplement the can support a healthy bladder. The capsules are easy to swallow and this eliminates the problem of bitter or unpleasant taste. Colostrum6 by Immune-Tree contains natural biological life factors (immune, metabolic, growth) so your immune system is given 100% stronger support. Contains 3% of Lactoferrin, 25% total Immunoglobulins, and 24% Proline-Rich Polypeptides. This product contains a patented ratio of potassium and sodium minerals in hydroxide to instantly raise the pH of your drinking water. AlkaLife® is a remarkable product to help promote normalcellular alkalinity. Serrapeptase is a proteolytic enzyme originally isolated from the silkworm. It is now synthesized in Japan where it has been extensively studied for healthy inflammation response specifically for respiratory health and bladder health. Marshmallow root tea has been called the “aloe vera for internal organs.” It helps promote urinary tract health. When taken on a regular basis, Moducare® sterol and sterolins can support the body's immune-regulating functions and contribute to good health. SagaPro® is a proprietary, aqueous leaf extract of the herb Angelica archangelica, which contains key components that support the smooth muscle tissue of the bladder. This product supports healthy bladder strength, function and urinary frequency.